It’s no secret that we love recreating our favorite takeout dishes at home. 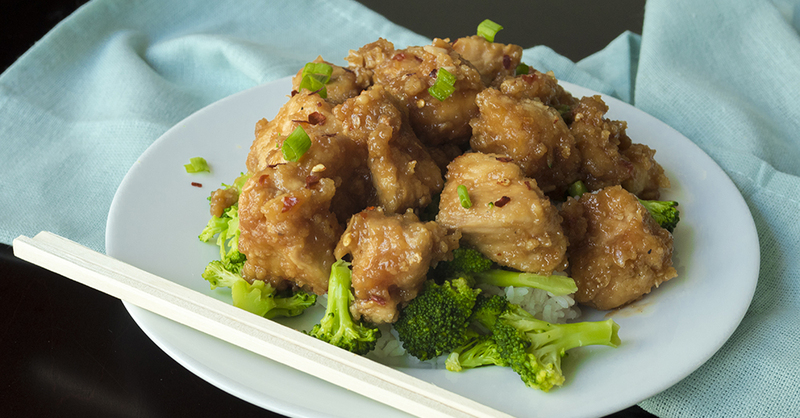 Our latest copycat recipe is for General Tso’s Chicken, one of the most popular entrees at Chinese restaurants, and one of our personal favorites. Who doesn’t love this fried chicken dish that’s swimming in a sweet and slightly spicy sauce? The best part is how easy it is to make – after pan-frying the chicken, we toss everything into the slow cooker and let it do the work for us. Another great reason to make this dish at home is it allows us to customize the heat level – from a fiery hot inferno for the spice lovers, to non-existent for the kiddos. We love being able to whip up one of our faves in our own home, knowing exactly what’s in it, and knowing it will be absolutely delicious, every time we make it! Give it a try – we bet you’ll love it just as much as we do! Beat egg whites together in a shallow bowl and place cubed chicken in bowl to soak. Place cornstarch, salt, and pepper in a gallon-size, plastic, re-sealable bag, then add chicken cubes to the bag. Seal bag and shake vigorously until chicken is thoroughly coated. Heat vegetable oil in a large skillet over medium-high heat and brown chicken on all sides. 1-2 minutes. Grease the inside of your slow cooker with nonstick spray, then whisk together sauce ingredients (sugar, pineapple juice, soy sauce, apple vinegar, garlic, ginger and red pepper flakes) together until combined. Place 1/2 browned chicken in slow cooker and top with 1/2 of sauce. Top with remaining chicken and remaining sauce, then toss together. Cover slow cooker and cook on LOW for 3-4 hours, or on HIGH for 1 1/2-2 hours. Serve chicken with broccoli and white rice, topped with green onions. Enjoy!